Demonic Frenchies Take Over the Hague! Uh oh.. we knew it had to happen sooner or later. 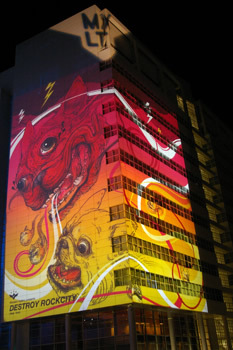 Yup, it’s giant demonic French Bulldogs, possessing an entire office building in the Hague. we’ve come up with another very exiting installation where we will use 2 DLP video projectors (20K ansilumen each) and a set of Wacom pads to enable severeral artists to create artwork live during the 2 festival evenings from 20.00 to 23.00hrs. Performing graphic wizards are Antistrot (4 members simultaneous drawing action), Inocuodesign (JAVIER GUTIERREZ GIL and DAVID FERNANDEZ ORENGO)and Kustaa Saksi or Mike Young of Weworkforthem (not defined yet). Frenchie artwork is by DestroyRockCity. You’ll find more of his weird, wonderfully funky stuff on the nav menu on his site – just look under anything with ‘devil dog’ in the title. Tip o’ the hat to Luisa at Lassie Get Help for the link. See? I told you she always has the cool stuff. https://i0.wp.com/www.bullmarketfrogs.com/wp-content/uploads/2015/04/Brindle_pied_frenchbulldog.jpg?fit=662%2C662 662 662 frogdogz http://www.bullmarketfrogs.com/wp-content/uploads/2015/06/bullmarket-logo.png frogdogz2008-07-12 15:26:362008-07-12 15:26:36Demonic Frenchies Take Over the Hague!